Wakamoto, N. (2009). Extroversion/introversion in foreign language learning: Interactions with learner strategy use.Bern: Peter Lang. 若本夏美. (2009). Moodle利用の英語学習の可能性と限界: 学習者のLearning Styleとの関連において. Asphodel 44, 170-188. Wakamoto, N. (2007). The impact of extroversion/introversion and associated learner strategies on English language comprehension in a Japanese EFL setting. Ed.D. Thesis, Ontario Institute for Studies in Education of the University of Toronto. 八島智子, 竹内理, 若本夏美, & 相知美佐. (2007). Teaching Manual: Revised Sailing （Oral Communication I）. 大阪: 啓林館. 八島智子, 竹内理, 若本夏美, & 相知美佐. (2007). Revised Sailing: Oral Communication I. 大阪: 啓林館. 若本夏美. (2007). 学習者の外向性特性と外国語学習：外向性は本当に愛されない要因なのか. 同志社女子大学総合文化研究所紀要, 24, 185-189. 若本夏美. (2005). パーソナリティ要因が外国語学習に与える影響について：日本人英語学習者へのMyers-Briggs Type Indicator (MBTI) の利用可能性. 同志社女子大学学術研究年報, 56, 135-139. Wakamoto, N. (2003). The role of questionnaires in second language acquisition research: How can we employ SILL, BALLI and EPI. Bulletin of the institute for interdisciplinary studies of culture, 20, 84-93. 若本夏美. (2003). EFLにおけるリスニングとメタ認知方略. 同志社女子大学総合文化研究所紀要, 20, 3-10. （Oral Communication I）. 大阪: 啓林館. Wakamoto, N. (2002). Language learning strategy research for the 21st century. Bulletin of the institute for interdisciplinary studies of culture, 19, 124-132. 八島智子, 竹内理, 若本夏美, & 相知美佐. (2001). Sailing: Oral Communication I. 大阪: 啓林館. Takeuchi, O., & Wakamoto, N. (2001). Language learning strategies used by Japanese college learners of English: A synthesis of four empirical studies. Language Education and Technology, 38, 21-43. Wakamoto, N. (2000). 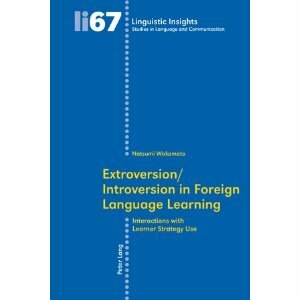 Language learning strategy and personality variables: Focusing on extroversion and introversion. International Review of Applied Linguistics in Language Teaching, 38, 71-81. 若本夏美. (2000). 学習者のパーソナリティ要因は英語学習とどのような関連があるのか, 英語教育学論集 青木昭六先生古希記念論文集 . 東京: 桐原書店. Kitao, S. K., & Wakamoto, N. (2000). Japanese speakers' refusals in English and Japanese: A pilot study. Bulletin of the institute for interdisciplinary studies of culture, Doshisha Women's College of Liberal Arts, 17, 80-93. Iida, T., & Wakamoto, N. (2000). A study of English teachers' beliefs about communicative language teaching in Japanese secondary schools. Annual reports of studies, Doshisha Women's College of Liberal Arts, 51(1), 1-29. 1997a. 言語学習と学習者要因の関連性について- MBTIを利用したPersonalityについての研究-　『同志社女子大学総合文化研究所紀要』第14巻　pp.166-179. 1993d. 英語学習の個人差と学習ストラテジーに関する研究　Step Bulletin, Vol. 5 pp 9-24. 1993c. Differences in the Uses of Learning Strategies Between More Effective and Less Effective Learners in Japanese Junior High Schools『中国地区英語教育学会研究紀要』第23号 pp. 277-280. 1992. A Comparative Study of Differences in the Uses of Learning Strategies Between Effective and Less Effective Learners in an EFL Context. Unpublished Mater's thesis, Hyogo University of Teacher Education, Hyogo. 若本夏美. (2009). 英語学習教材を自律的に継続利用するための ストラテジートレーニング. Paper presented at the 第49回外国語教育メディア学会全国研究大会, 神戸流通科学大学. Wakamoto, N. (2008). The impact of extroversion/introversion on learning English in a Japanese EFL setting. Paper presented at the 15th World Congress of Applied Linguistics, Essen, Germany. 若本夏美. (2007). 学習者の外向性特性と英語学習：外向性は本当に愛されない要因なのか？. Paper presented at the 第33回全国英語教育学会大分研究大会, 大分. Iida, T., & Wakamoto, N. (2000). Where do teachers beliefs come from. Poster presentation at Foreign Language Education and Technology IV, Kobe, Japan. 若本夏美、飯田毅 (1999). Teachers' belief 研究2：教育実習生からbeliefの形成過程を探る. Paper presented at the 第25回　全国英語教育学会　北九州研究大会, 西南女学院短期大学. Wakamoto, N., Saeki, N., & Nishizaki, K. (1999). The effects of controlled speech rate on listening instruction to Japanese learners of English. Paper presented at the 12th World Congress of Applied Linguistics, Waseda University, Tokyo, Japan.